I’m the last person to deny that my cats run the house. 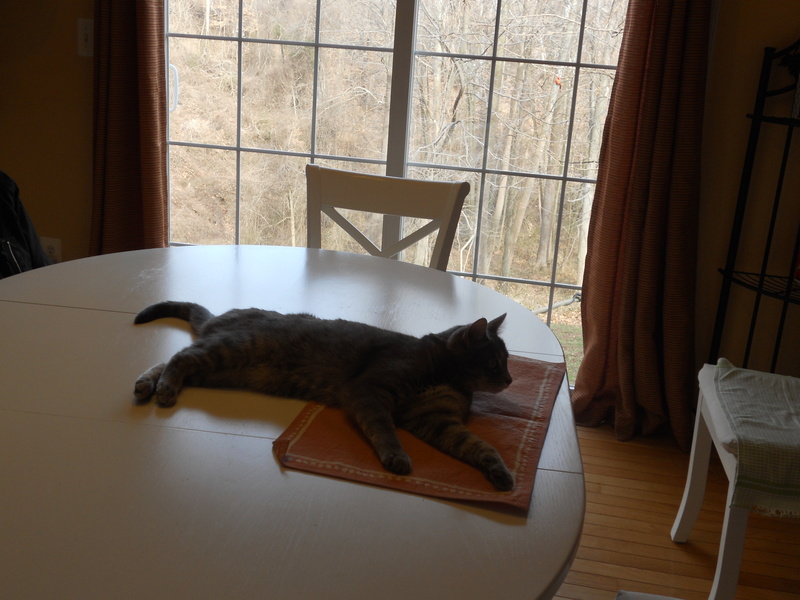 Free reign on the kitchen table, counters; whatever they want. I’m not proud of this; I’m just telling you the reality of being outnumbered by animals. I had a friend over for lunch today, so I spent the morning sanitizing the kitchen. 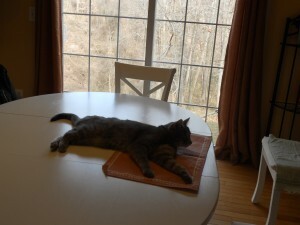 The very last thing I did was wipe down the kitchen table and put out clean, fur-free place mats. I turned my back for one split second, and that was it. That’s all Chrissy needed to go bounding up on the table. Granted, she’s on the table a lot. But I’ve never seen her skid across the table, flop down on a place mat, and roll around on it like a pig in mud. Honestly, never. And just as I was getting ready to yell at her and swat her down, she got unbearably adorable. Dag nab it! So I grabbed the other placemats before she could ruin those too, and then of course took a picture right as she was looking all innocent. Sigh. Dan noted it could be worse, and reminded me about a baby shower I hosted many years ago. First, my friend told me that one of the guests was absolutely terrified of cats. No problem; our cats at the time, Sophie and Mukki, were confined to the master bedroom as guests started arriving. The cat-phobic guest arrived and apologized for asking me to lock up the cats. I assured her it was no problem, but she decided at that moment to conquer her seemingly irrational fear, and after repeatedly insisting that I let them out, I did. Sophie and Mukki were social enough, friendly, but far from lap cats. It was like watching a movie when I opened the bedroom door and they went bounding downstairs, straight into the family room, and ran like cats out of hell directly into this poor woman’s lap. I’d never seen anything like it. I thought the woman was having a heart attack; I’m pretty sure she stopped breathing for a bit. I grabbed the cats and dumped them in the other room but the minute I turned around they came back at her again. I went to lock them up again, but Mukki wriggled away. When I went back to get her she was behaving normally, just skulking around sniffing things and certainly not jumping into anyone’s lap. The woman had calmed down and she said it was actually good, because the cats jumped on her but they didn’t bite or do anything horrible and they were so soft, etc., etc. Wow. I was pretty proud to have a couple of therapy cats on my hands. Who knows, maybe I’d even give them a treat later. While our guest of honor went back to opening gifts, I went in the dining room to check on lunch. I had poached a side of salmon and covered it in lemons and cucumbers; the last time I checked it looked like it was right out of a Martha Stewart magazine. Unfortunately, this time I found Mukki, face down in the salmon, chowing away like there was no tomorrow. Turns out she knew how to poach salmon as well. Hmmph. I pulled her off the fish, and there was literally a cat face shaped imprint on the salmon. If I’d tried to make salmon look like a cat face, I honestly couldn’t have done it any better. It wasn’t really Mukki’s fault; what kind of moron leaves a cat loose with a bunch of fish? I’d just sort of forgotten she was out. I put her away again, and as I had twenty guests and nothing else for an entrée, I had no choice but to cut all the way around the part she had touched, and fill it in with a lot more lemons and cucumbers. Ever since then, the rule is that if we’re having company, the cats get locked up at least until we’re done eating. But today I didn’t even have any food out yet! Luckily, my friend has a whole menagerie of her own, and understood completely. 5 Responses to What Would Martha Do? How did I not see this post back then? Fortunately my cats do not come out when there are guest…mostly…except for Gracie….and maybe Morgan. I did have Gracie hop on the kitchen counter (not the food one but the one where I feed her) and look at me like it’s dinnertime. My friends were appalled (although trying not to look it). Cats are a good way to filter friends. And sassy loved chocolate chip cookies. Wiggles goes “woof”. Was it Reilly who ate an entire platter of burgers? Ain’t gonna happen…and Martha Stewart has dogs (and I believe she is a closet meanie with them as she is with everybody else). Consider the cats a good way to filter company that wants to come over..
You are a wise woman Mimi.